The Building the New World Conference (“BTNW”) is an international, evolutionary event that will take place May 28 – May 31, 2015, at Radford University in Virginia. FIC is a co-sponsor of this conference and we encourage you to register at www.BTNW.org. BTNW will focus on the reality that our planet is endangered in multiple ways and that it is no longer feasible to reform crumbling and corrupt institutions. Therefore, humanity must quickly shift from imperialism to social democracy, from materialism to altruism, from environmental destruction to organic networks, from religious separation to spiritual unity, and from a war system to a peacebuilding coalition… and fast! 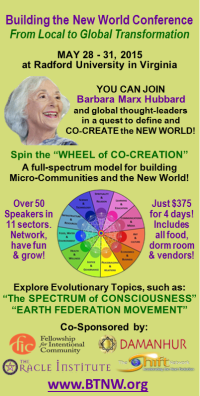 The conference is based on the “Wheel of Co-Creation” designed by Barbara Marx Hubbard, who is opening the conference. The Wheel contains eleven “full spectrum” sectors, all of which will be explored during the conference. BTNW will encourage attendees to reach beyond their particular area of interest and expertise and begin the process of synthesizing data across multiple disciplines. This emphasis on networking and exploring creative solutions will underscore the need for REAL ACTION and TRANSFORMATION! Join over 40 thought leaders, including Ms. Hubbard (Foundation for Conscious Evolution), Charles Eisenstein (social entrepreneur), Dr. Jerome Glenn (Millennium Project), Grandmother Mona (13 Indigenous Grandmothers), and Philip Hellmich (Shift Network). BTNW is co-sponsored by over 100 organizations and micro-communities, including Shift Network, World Constitution & Parliament Association, and Federation of Damanhur (only full spectrum community on Earth). ← How does your group respond to conflict?